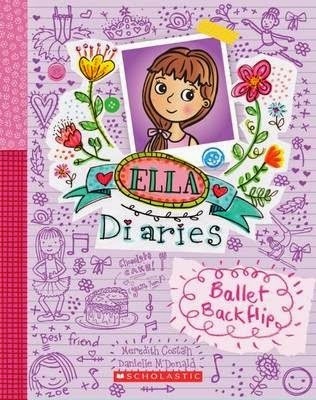 Meredith Costain’s second book in the Ella Diaries is built around Ella’s love of ballet and physical activity. The fantastic illustrations by Danielle McDonald give visual reinforcement to the fast and clever dialogue that becomes Ella’s daily and nightly diary ritual. Ella’s Saturday morning ballet class at La Madame Fry’s Ecole du Ballet (Madame Fry’s Ballet School) has given her great confidence and flexibility. She loves to practice her plie, jete, jumps and twirls, and pays special attention to her technique and keeping her bottom tucked in. Madame has written a dance play for the children to perform. But alas! There is only one lead role; that of Fairy Queen. Ella believes because of her dedication, the part will be hers, and she’ll get to wear a floaty dress of tulle. Her thoughts and dreams are duly recorded, as are her hopes to influence Madame Fry to create an added role for her BFF Zoe, as Butterfly-in-Waiting. But competition is strong. Will Ella get the part? What about the new gymnastics craze that Peach Parker, the queen of nastiness has started? Will Ella decide to exchange ballet for the new craze along with everyone else? Ella’s diary entries are highly entertaining with her shape poems and super-cool illustrations. There’s always something new and interesting to learn. Random funny incidents are thrown without reason into the story. These made me laugh out loud! It’s fantastic the way it was done. Full of fun, life lessons and challenges, Ella is a star! There is lots of information about ballet and dance techniques, new words, and definitions of expressions used for those unfamiliar with ballet terms. The story is so alive girls will love this series and long for the next one. This book’s illustrations are purple. Its themes cover making decisions, the importance of activity of all kinds, the dangers of yielding to peer pressure, and the importance of staying true to yourself.